Friends, hello. 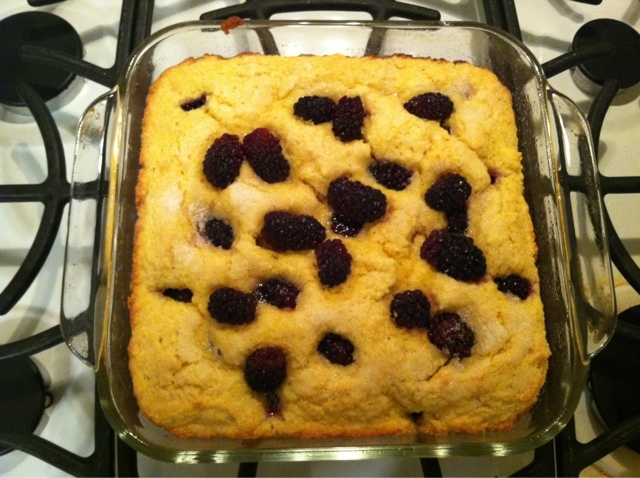 It is time for me to tell you about the blackberry cornbread I made a couple of weeks ago. I made it on a whim on a weeknight, which is a pretty cool thing. I usually have little desire to do anything after work. Haha. 1. The middle didn't cook very well. I kept it in the oven a bit longer than was suggested but I had to stop that after a while because I baked in a glass dish and could see the majority of the bread was getting brown quickly. This did not deter the eating, thankfully. 2. I never like blackberries as much as I would like. They are good to eat in stuff and on their own, but I seem to be limited to three. Maybe less. Why is that? Seems unfortunate to me. Anyway, if you're interested in delicious things, cornbread and blackberries, you should make this. I vote yes!